As Australia's undoubted leaders in political prognostication predicted, WA summarily rejected Pauline Hanson's One Nation last weekend. ONE OF THE ADVANTAGES of following Independent Australia is being given the good oil. This is because IA doesn't follow the pre-prepared mainstream media narrative. It is not being in any way boastful to say that IA is more accurate in its political prognostications than any other Australian publication. This has simply, time and time again, been proven to be the case. Looking at the last few elections, we were the only ones to predict the shock Queensland election result in 2015 and we were right on the mark again in last year’s Federal election as well. We also predicted Trump's victory (dammit). Let’s start with the lower house Legislative Assembly candidates, babes in the woods one and all. They have been roped in and paid out good money on the grounds they might get elected. In fact, none of them have any chance; PHON will not win one lower house seat. Upper House candidates, of which there are 17, won’t fare much better, but because of the preference deal with the Liberals, three do have a chance of getting up: WA PHON party leader Colin Ticknell, Jerramungup farmer Rod Caddies and ex-cop Charles Smith. As we now know, One Nation will not win a single WA Lower House seat and may only win one Upper House one — perhaps two. Prophecies don't get much better than that. And so this week, in the wake of the landslide victory for the ALP, a reasonable showing by the Greens and humiliation for the Liberal Party and One Nation, it is only fair to let Mr Jones here give us his reading of the results and what they mean. The WA election is over, but its shockwaves will reverberate across the country until the next showdown in Queensland sometime later this year. The massive swing to Labor in the lower house has put a definite spring into the step of Federal Labor members, but it’s a long way to the next Federal election. WA state issues – mainly resentment that the Libs had blown the mining boom and left the place in a mess – played a central role in the electorate’s overwhelming rejection of the Liberals. But so too did the general nationwide sentiment that the Liberal Party has lost the plot. You can probably divide the swing between the two: 50% to local issues and 50% Federal. That means WA Labor was always going to win, but the extra surge to become a landslide was delivered by Federal Liberal incompetence. Cormann didn’t help that cause, when he supported Barnett’s desperate grab for One Nation preferences. 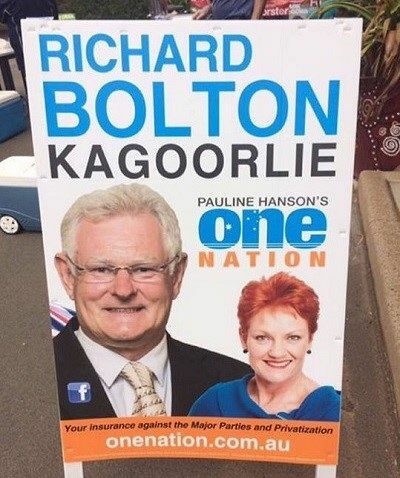 That deal hurt both ways, with many potential One Nation voters suddenly realising Hanson was just another deal-doing politician and many potential Liberal voters being repulsed by the whole idea of going anywhere near One Nation. It was truly dumb and shows Liberal Party strategists are unable to read the necessary tea-leaves. As for One Nation, it never really expected a Lower House seat. It attracted a lot of candidates, but head office never really expected them to succeed. They were there, at their own expense, simply to provide the illusion of organisation for the main game — Upper House seats. And here, too, One Nation failed. They were hoping for five or six Legislative Council seats. They have one and might squeak another. One Nation WA leader and successful candidate for South West Region, Colin Tincknell, told members on Monday he expected three and maybe even five seats. Colin might enjoy his pipe dreams for another week or so until counting is finalised. Then reality will strike. The treatment meted out to One Nation Lower House candidates will have been noted by One Nation Queensland candidates. Already, there are rumblings in the ranks, so prepare for a turnover of Queensland candidates during the next month or so. This will not help the party’s prospects of success at the election. And the LNP is going to be very gun shy to do more preference deals, so they won’t be any help. The WA Upper House will be a dog’s breakfast thanks to dog whisperer Glenn Druery. It is possible, Labor/Green will get the numbers to control the Council, but the wild card will be which of the micro parties Druery’s machinations bring to power — maybe Flouride Free. Shooters and Fishers are in the mix for a couple and the Liberal Democrats might get a guernsey. The real loser is Malcolm Turnbull, whose grip on the greasy pole of power just got a lot weaker. He may be in line for the long drop. Click HERE for up-to-date WA Electoral Commission election results. Ross Jones is the author of 'Ashbygate: The Plot to Destroy Australia's Speaker'. Think for yourself. Subscribe to IA for just $5.